Virginia Gov. Ralph Northam said in a statement on Friday that he appeared in a “racist and offensive” photo, but on Saturday, Northam said it wasn’t him in the picture. Northam said that he darkened his skin for a dance contest in San Antonio that same year to imitate Michael Jackson. The legislative Black Caucus continues to demand Northam’s resignation after his remarks Saturday. 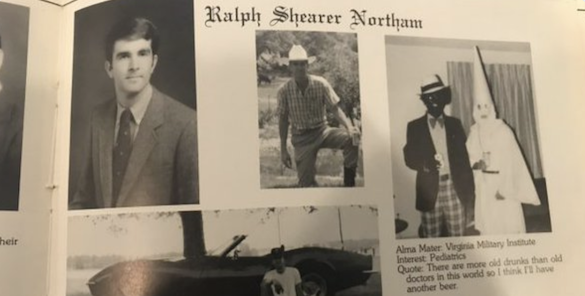 A photo released on Friday from Northam’s senior medical school yearbook page shows a man wearing blackface and another wearing a Ku Klux Klan robe. 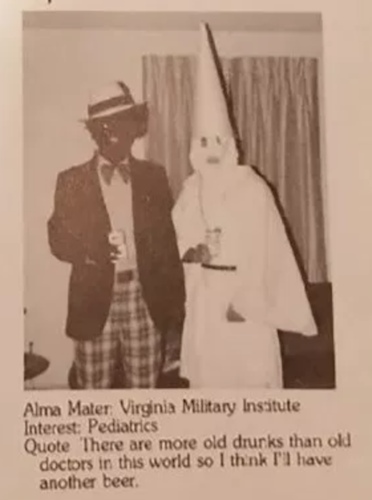 “Earlier today, a website published a photograph of me from my 1984 medical school yearbook in a costume that is clearly racist and offensive,” he said, in a statement. However, the Eastern Virginia Medical School graduate didn’t indicate if he was the man in blackface or wearing the KKK robe. The picture first began circulating after being posted to Twitter by a right-wing blog Big League Politics, and WTKR shared the page in the yearbook on which the photo appears. Northam continues to lose support from key Democrats, including members of the Virginia House Democratic Caucus and Virginia Senate Democratic Caucus “saddened” by the photo. They want him to resign. Northam began his tenure as governor in January 2018, after defeating Republican nominee Ed Gillespie in the 2017 election. He served as the 40th Lieutenant Governor of Virginia from 2014 to 2018.